HARDPAN LAYERS. 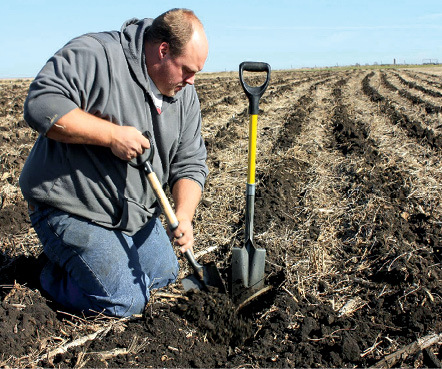 Strip-till and no-till are recognized for their ability to reduce compaction, but compaction layers can still be more prevalent than many farmers think. Often time, the only way a farmer can be sure about how deep and thick their compaction layers are is to go digging for them. To hear what the soil is saying, though, growers need a good shovel, says the owner of Kimberley Ag Consulting, in Maxwell, Iowa. At the 2nd annual National Strip-Till Conference held this past August in Iowa City, Iowa, Kimberley told strip-tillers that diagnosing ailing crops is often as easy as peeking just beneath the surface of the soil. When digging for answers, there is technique to consider. Kimberley often finds that farmers’ knives or coulters on their rig are blowing soil out of the strip rather than cutting through, which can cause a void at the bottom of the strip that runs its length. An empty space at the base of the strip compromises the seedbed.